I’ve always been haunted by the sea, even before I knew the full story of my grandad, the man who in part inspired How to be Brave. I live with my husband on the outskirts of Hull – the UK’s 2017 City of Culture – where from my bedroom window I can almost see the waters of the River Humber, an estuary that inspired The Mountain in my Shoe. My children have grown up and left home, so I fill that void with writing. It’s filled many voids over the years. Doing research for How to be Brave, with a picture of the grandfather I never met. I remember sitting as a child in my father’s lap while he tried to show me guitar chords. He was a musician. But my small fingers couldn’t do it. I was three. His music sheets fascinated me though – such strange language that translated into music. My mother taught languages, French and English; I probably inherited her fluency with words. I knew from being small that I wanted to write, to make magic as I felt it was. Proudly signing a pile of my books. I love all forms of writing. My short stories have won the Glass Woman Prize, the Eric Hoffer Award for Prose, and the Aesthetica Creative Works competition, as well as shortlisting twice for the Bridport Prize and being published in a variety of UK magazines. My first play, Afloat, was performed at Hull Truck Theatre. My Hull Daily Mail colmuns garnered love/hate criticism. My debut novel, How to be Brave, was released in 2015. It got to No 4 in the Amazon UK chart, and was a Guardian Readers’ Pick. My second novel, The Mountain in my Shoe, was released in 2016 and was inspired by my time with children in care. It explores what family truly means, and how far we’ll go for those we love. It longlisted for the Guardian Not The Booker Prize. Maria in the Moon was released in 2017, and was a Must Read in Prima, Red, and the Sunday Mirror, as well as being widely reviewed by the press. It was compared to the early works of Maggie O’Farrell. Talking about Maria in the Moon at an event in Glasgow, with Madeleine Black and Michael J Malone. The Lion Tamer Who Lost was released in 2018, and described by the Daily Express as ‘captivating and engrossing’ and by Good Housekeeping as ‘heartbreaking and uplifting.’ It was a Love Reading Star Book. My fifth novel – possibly titled Call Me Star Girl, watch this space – will be released in April 2019, and is quite a departure for me, in that it’s a psychological thriller. Having sold all the books at one of my early Waterstones signings. Just found you, and your blog. Inspirational. I too have been writing for what seems a lifetime, always pushing stories in drawers, never taking the plunge so never getting a rejection. I too have written on scraps of paper since childhood, making up stories and plays for my toys to enact. I think it’s about time I took myself and my writing seriously. A huge thank you. Great blog, great website. I have bought both your books and they’re on my kindle to read. I’m working on my second book to send to the publisher on Monday so limited time for reading, as I’m also a full time English teacher in a secondary school. Who is your agent, by the way? I’m always interested in who represents who. Thank you so much! I hear you on the time to read, so totally understand. I have soooo many books that I long to read and less time now than ever. I will look up your first one. Good luck with book two! I don’t have an agent. Just little old me. Who is yours? Hello, Louise. I came across your article in the Bloomin’ Brilliant Books blog today and figured this was probably the best way to communicate with you. I have never written to an author before but why not? I wanted to let you know that I just finished The Mountain in My Shoe on holiday and loved every word. I devoured it as slowly as I could to best savor it. I have just ordered How to Be Brave and look forward to Maria in the Moon. I’m a picky reader with a 500+ TBR wishlist–and while I enjoy many literary genres and most of what I read, every once in a while I find a stunning novel that lingers in my head. Thanks to the Guardian’s Not the Booker for introducing me to your works. And thanks to you for the pleasure I had and will have in reading your books. Cheers. Hello there! Wow, thank you so much for taking the time to write to me! I am HONOURED to please such a ‘picky’ reader. (I’m picky too, for the record!) Thank YOU for the pleasure you’ve given me by telling me. Have a wonderful Sunday, and do keep me updated on what you think of the others. Hi Louise, I came to your library talk in Willerby last year when you talked about your writing journey. 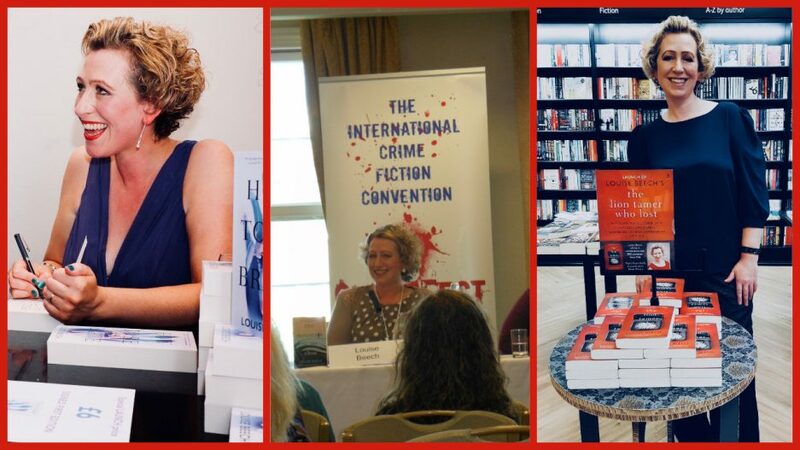 I do a blog for the Romantic Novelists Association (hints & tips for new writers) and I wondered if I could interview you, specifically about the importance of persistence? Your story was just so inspiring and I really think it applies to any genre. Have you written your best book yet? I’m in my safe place when I sit down and write. The only place where I really know what I’m doing. And I love getting lost in it.